Abstract Art: Richard Diebenkorn, Joan Miró, Gerhard Richter, Willem de Kooning, Constantin Brancusi. Last post I showed some fabuluos pictures of modern abstract artists studios. Given the high number of visits the article received, I have decided to show you some more. Are you a contemporary abstract artist : painter, sculptor, photographer …..? Would you like to have your abstract art studio posted here?. Contant me below. I will write a post that includes pictures of abstract artists studios. Ok, lets start. Isn´t it interesting to still see Constantin Brancusi modern sculpture studio in the above picture?. Do you think he started his famous endless column here? Whose contemporary artist would you say works in the above studio? …. Gerhard Richter. If you search in youtube you can see videos of him making this world famous modern abstract paintings. Quite interesting exercise to do. I do also recommed you reading this article with lots of examples of Richter´s art as well as some recommended books. 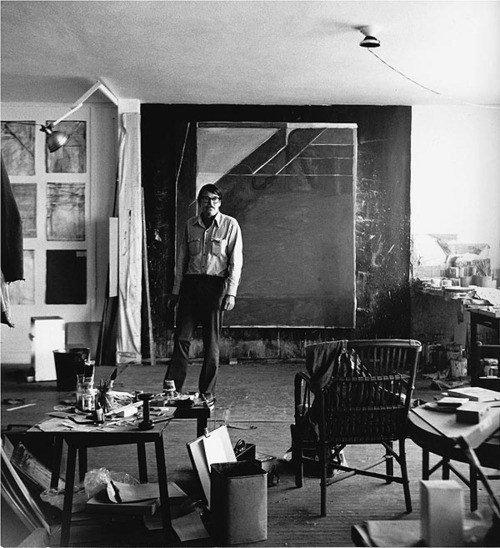 Yes, the above is Richard Diebenkorn drawing in this studio. Behind him I think there are some preparatory abstract drawings¿?¿? of his Ocean Park superb abstract paintings. 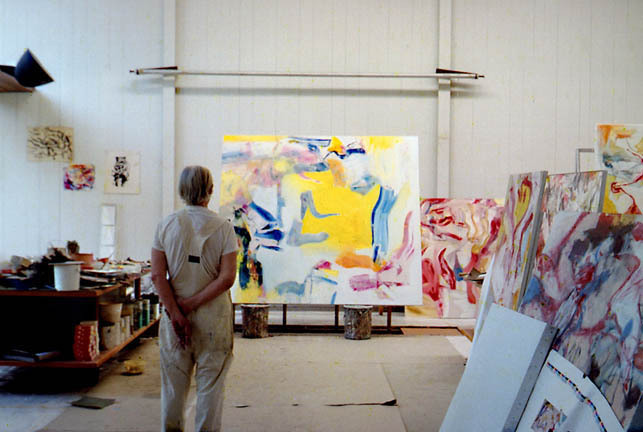 To finish this article, a picture of Willem de Kooning´s studio. 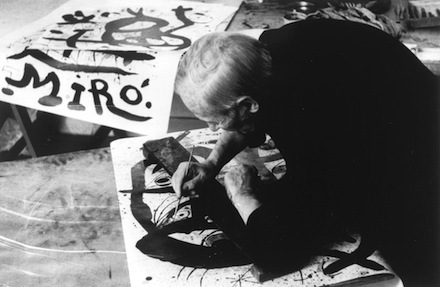 I find interesting the way he was preparing the unfinished modern abstract paintings shown. I would say its charcoal but I´m not sure. Any body knows? 10 Responses to "Modern abstract art and artists: studios (II)"
Hi, I’m Ryan Mingone from Winona State University, Art Education Major. This seems right up your alley! The publicity would be a major blessing. Hi Ryan, thanks for including this video. I am waiting to receive more abstract artists studio images to write the post. Artist studios is just about the only interesting article I’ve found on this site. Hi Sandra, I´m glad you find artists studios articles interesting. As you are a critic person and we all love art, maybe you could share with us other interesting art blogs. Seeing inside artists’ studios is as close as one might get to exploring Aladdin’s cave or searching for buried treasure. I hope not to find anything to do with the tobacco industry. Maybe you might like to explore my website, a competition/project that is free to enter and is by photograph only. Hi Fay, thanks for sharing your thoughts about modern artists studios. I´ve reviewed your art project and find it a honest, committed initiative. I wish lots of success. By the way, I smoke since many years ago and have tried to quit several times but still not able!!!. Very nice. Thanks for the great studio pics. I believe deKooning did use charcoal to start as well as a lot of painting on kraft type paper that he cut into shapes and positioned on his canvas to see what it would look like and perhaps affix them to create his work. Hi Warren, very interesting comment. I belive its good to know how modern and contemporary artists make their arworks. It helps people undestand that abstract art it´s not as simple as some may think. Thanks for sharing your knowledge and hope to read you again in future articles. Thanks for posting these windows into these artists’ studios. No matter how many studios I visit, it’s always a thrill. The Brancusi atelier in Paris is particularly captivating, which is surprising since you are looking through glass partitions and not actually walking among the artifacts. Yet it’s a real gem and perhaps the highlight of visiting the Pompidou Center. Hi Julie, thanks for sharing your thoughts an personal experience. 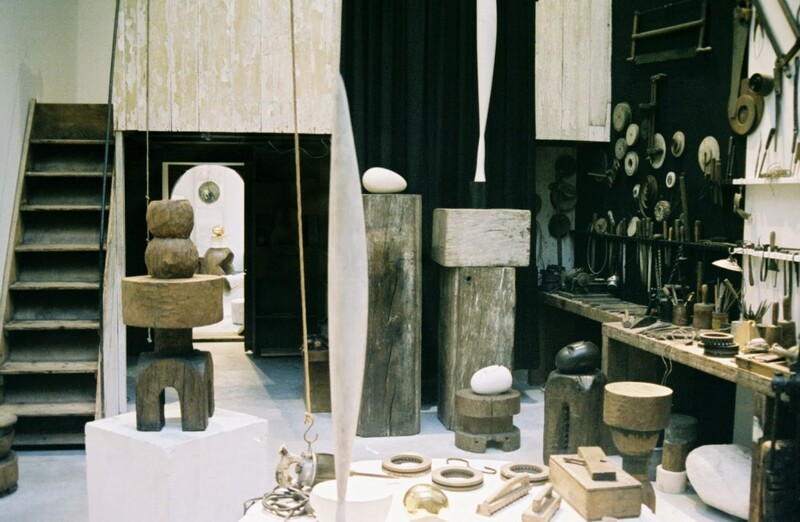 I do agree with you that Brancusi´s studio is a gem. Here in Barcelona, I life in a traditional artisan neighborhood. Some of their studios are hiper captivating as well :). Look luck and inspiration with your art. See you soon here and feel free to share the article with your friends.